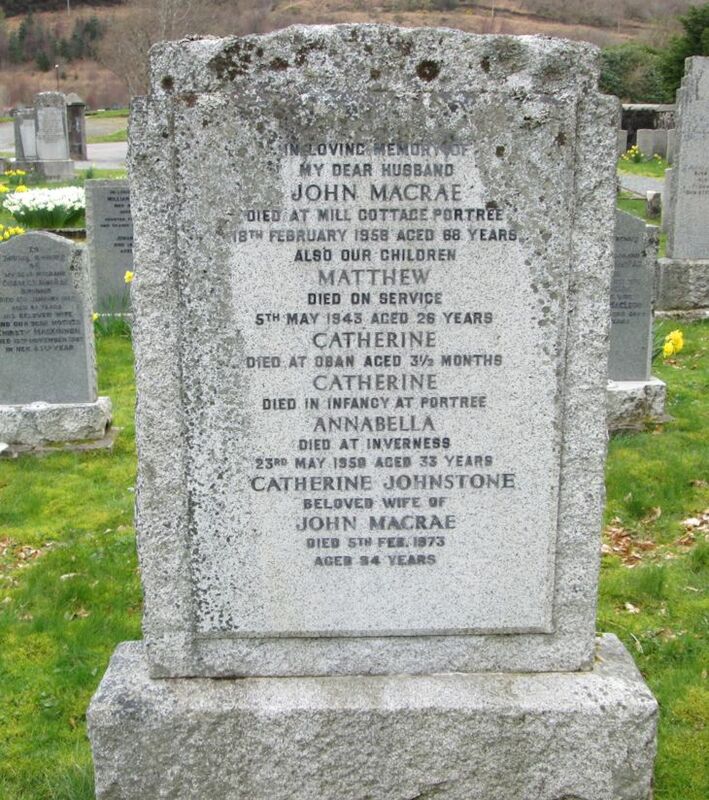 Skye Gravestones | John & Catherine (Johnstone) Macrae & family. John & Catherine (Johnstone) Macrae & family. In loving memory of/my dear husband/JOHN MACRAE/died at Mill Cottage, Portree/18th February 1958 aged 68 years/also our children/MATTHEW/died on service/5th May 1943 aged 26 years/CATHERINE/died at Oban aged 3 months/CATHERINE/died in infancy at Portree/ANNABELLA/died at Inverness/23rd May 1950 aged 33 years/CATHERINE JOHNSTONE/beloved wife of/JOHN MACRAE/died 5th Feb. 1973/aged 84 years.